The future is green with possibility and the Post-Apocalyptic Hook Blade Sword has the features you need to survive in the wastelands of tomorrow. 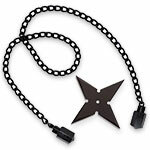 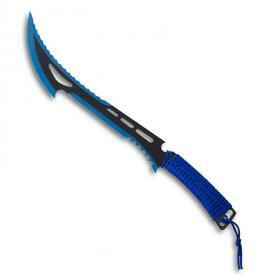 First, this ninja sword is full tang, meaning that it won't fall apart in two pieces. 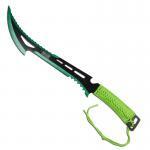 Forged out of one piece of durable stainless steel, the dark green hook blade sword has a handle wrapped in bright green paracord for comfort. 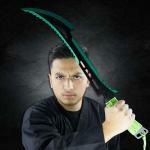 This green sword measures 24 inches long and weighs just a pound, making it perfect for melee combat. 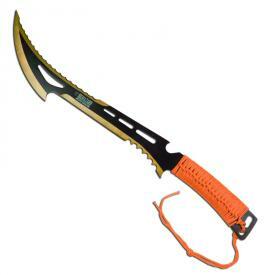 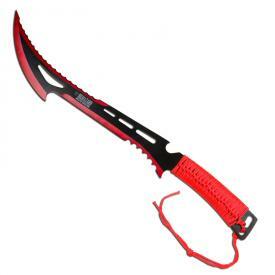 The two-toned green and black blade is 17 inches long and has a specialized design that features a hook on the front, which can be used for disarming or for wreaking havoc on the insides of someone you've stabbed. 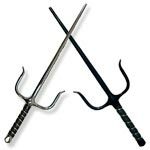 The serrated edge on the spine of the sword will also do a fair bit of tearing. 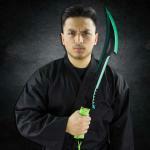 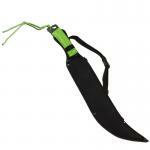 The black nylon sheath that comes with this green ninja sword is perfect for protecting it from the elements, as well as fastening to yourself for easy access.